Finished up my “Aurora Borealis” Stole and happy with the result. I winged the gradient effect to use up two full skeins of Malabrigo Silkpaca and added slip stitch borders on the short ends. The beads are #5 Miyuki in an iridescent blue purple that picked up the tiny bit of purple in the “Azules” colourway. My “Starburst” Hat is blocked too – love the balloon trick! It’s size Small, for a Littlie so no modelled photos. I didn’t forget you – just busy with real life. That does include knitting and such but not so much to share. I’m mid-project on several items, as per normal, keeping up with store orders, looking after my Mum and adjusting to this new ‘sans Papasan’ life. The good news is: thanks to Louise, manager at my LYS (Yarn Forward) and the constant encouragement of my Bestie (Frankie), I have a solid pattern presence at a bricks-and-mortar shop. Yay!! So if you are ever in the neighbourhood, you can find patterns and samples there. I just wrapped up the Kitchener close on a cowl, no pattern – The Bing On My Cherry – just using up some gorgeous Elann Highland silk and a new skein of Lang Mohair Luxe and am working a super cute, easy cardigan pattern from Plucky Knitter – Put The Kettle On – in some ancient Debbie Bliss silk merino aran. 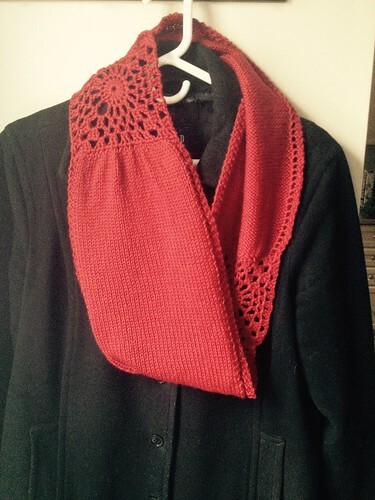 I’m using more stash – Yarntini this time – to work the Leventry shawl or as I call it, Leventry-tini. 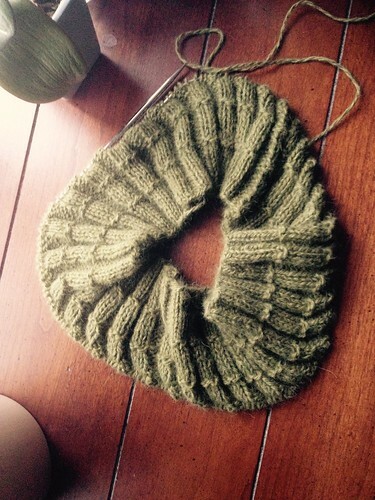 Silky Cables is off the needles. Yay! Shown here with the original in all it’s matted mohair / acrylic glory, just for good measure. If it’s Welsh or Wales, I’m all over it and I’m hearing that Marici silk lace calling me! 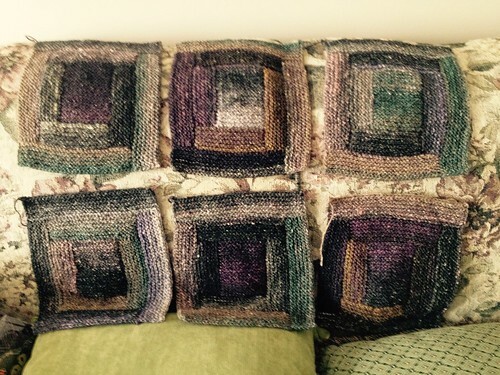 I’ve a busy day today that will preclude knitting – I wish Atavan was available OTC! 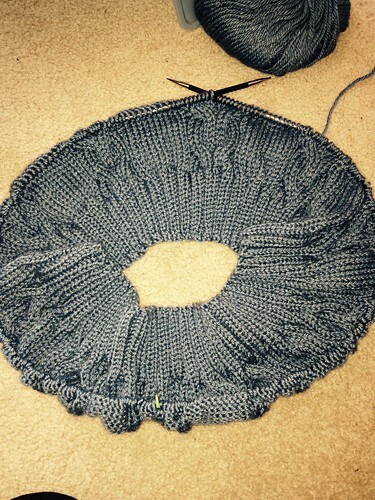 – but the test knit for Arcadian’s double loop sister should be underway by this evening. I really like this blocked and finished and might just keep it! 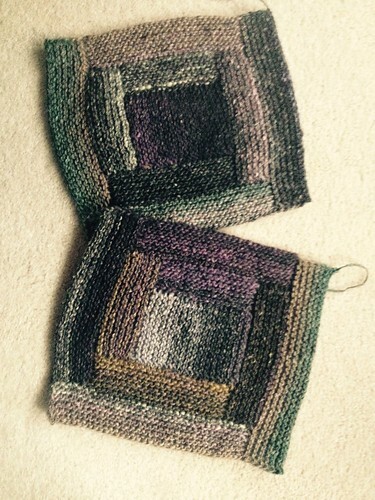 And as knitting is my Valium, I jumped into yet another project. This is another buster of most ancient stash and easy on the hands so far. 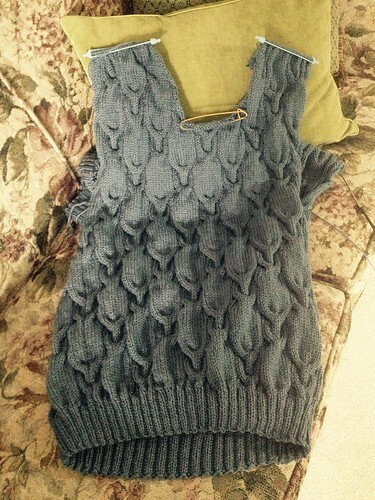 KFI’s Angora Extra, has been languishing in my stash for at least 5 years and when I found it a few days ago, I wanted to knit it but was out of love with the original pattern I chose. Elsebeth Lavold to the rescue and I now have a couple centimetres of “Halle” underway. This is a pleasure to knit for many reasons. I almost never repeat a pattern but this one’s worth it. It’s great to be using up stash – as some of you may know, I’m not kidding about the shop’s worth of yarn – this silk / wool blend is great to work with, the colour is soothing and the knitting is almost mindless. A big boxy knit, drop shoulders – so, no shaping save the neck and version one is still a “weekend round the house favourite”. These are the first six and from my bag of 10 skeins (Colour 243 B), I was able to get 12 squares with some leftover for mending. (c)2006 – 2018 KeiB Designs and Karin Bole Tupper. All content is copyright protected and may not be reproduced in any manner. Free patterns may be downloaded for personal use only unless other permissions are given. Posting free patterns from this blog on your own site is a copyright violation. If you like what you see and want to share it, that is wonderful! When doing so, please link to Pointe Shoes Punk Rock And Purl to share the love.